It’s been a while since I baked anything because these days my hands are full with my two and a half year old son. The once very independent and “I-couldn’t-care-less about-you” attitude son has become so clingy, wanting my undivided attention literally 24/7. I wish that it’s just a phase. I managed to bake these double chocolate cookies in the little time that he was napping last week. 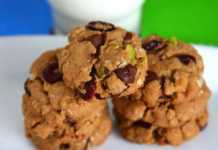 So easy to put together these cookies are very big on taste and was devoured by the kids I had baked it for. I found the recipe here and made few changes to make it egg free. I usually whip together the egg replacer powder and water together until its frothy and then add it with the rest of the wet ingredients. This time I wanted to try adding the egg replacer and water directly to the creamed butter mixture and it did work. The cookies turned out great. The original recipe had all-purpose flour in it which I replaced with whole wheat pastry flour and nobody found it different at all. 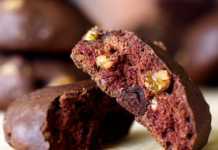 For small chocolate cookies, check-out the egg-free chocolate shortbread cookies as well. Preheat oven at 375F/190C for 15 minutes. In a medium size bowl combine together the ingredients mentioned in Part 2. In a large bowl, cream together butter and sugar until light and fluffy. Add the egg replacer powder, water and vanilla extract; beat well. Stir in the flour mixture, chocolate chips and pecans. Drop the dough by half tablespoonfuls on an un-greased baking sheet and flatten the dough lightly; bake for about 7-9 minutes. 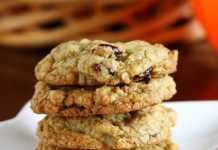 Remove from the oven and leave the cookies on the cookie sheet itself for another 3-5 minutes before transferring the cookies to a wire rack to cool completely. have been a little less sweeter. So if you are like me I would suggest using 1 cup of sugar or use 3/4th cup of chocolate chips instead of 1 cup. I used half tablespoon measurement to scoop out the dough and got 75 small cookies. I didn’t flatten the dough for the first batch, so the cookies didn’t spread much. It had a cute mound shape though. But if you prefer a flat cookie then press the dough lightly. Next RecipeHave you tried Hypoallergenic Diet? 1) Is brown sugar called demerara sugar? 2) What is the option for egg other than egg replacement powder, buttermilk and how much to use in this recipe? 3) Is maida all purpose flour? 4) I strongly encourage you to use other words as it will increase the understanding for beginners like me. Thanks Gaurav. Brown sugar is not demerara sugar. Buttermilk does not work well in cookies. You can use flax seed powder instead. Yes maida and all-purpose flour is one and the same. HI.. thanks buddy. I hope to try it soon . How much of flax seed powder is equal to an egg? Blend 1 tablespoon of flax seed meal with 3 tablespoons of warm water. You may add another tablespoon of water if you think the dough is too thick. i make whole wheat eggless cake by using pureed fruit & lemon juice in baking time in lot of sponge but within 1 sec it sinked & become little hard. I’m guessing that the recipe has too much liquid. Send me the recipe you tried and see if I can figure out the problem. I tried this and it came out very well.but it tasted more like a brownie than a cookie…. any suggestion..
Maybe you should have baked it a minute or two longer. 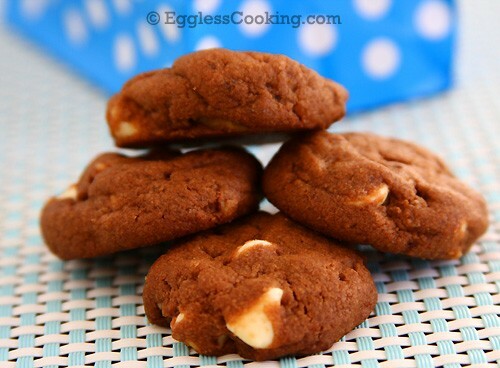 Coconut palm sugar sounds interesting, scrumptious cookies..